Author(s): Abdenour Belkacemi, Charles Ramassamy. INRS- Institut Armand Frappier, 531, boul. des Prairies, Laval, Quebec, H7V 1B7, Canada. Alzheimer’s disease (AD) is the most prevalent neurodegenerative disorder of aging. It is a multifactorial disease with several overlapping pathways. Therefore, successful therapy should target several pathological features simultaneously. In this regard, cumulative data have demonstrated that polyphenols can display neuroprotective effects through different mechanisms. In this study, we tested the hypothesis that a mixture of anthocyanins/anthocyanidins presents in the formulation MAF14001 may mitigate the amyloid-β peptide (Aβ) toxicity. Anthocyanins are a class of polyphenols capable to cross the blood brain barrier and their intake is associated to a reduced risk of some several chronic diseases. Our results showed that the formulation MAF14001 can protect SK-N-SH cells against Aβ-induced toxicity. From 5 µM, MAF14001 protected SK-N-SH cells against Aβ toxicity by preventing oxidative stress, mitochondrial dysfunction and apoptosis. Furthermore, MAF14001 might directly interact with Aβ to prevent its aggregation process, a key process on Aβ-induced oxidative stress. Indeed, in the presence of MAF14001, Aβ was less susceptible to fibrillation. Finally, MAF14001 decreased the tau phosphorylation (Ser-202) induced by Aβ. Altogether, these results demonstrated that MAF14001 could target multiple mechanisms involved in the etiology of AD and could be useful in preventing and treating AD. Keywords: Amyloid-beta, tau phosphorylation, apoptosis, mitochondrial membrane potential, oxidative stress, polyphenols, protein carbonyls. Affiliation:INRS- Institut Armand Frappier, 531, boul. des Prairies, Laval, Quebec, H7V 1B7, Canada. 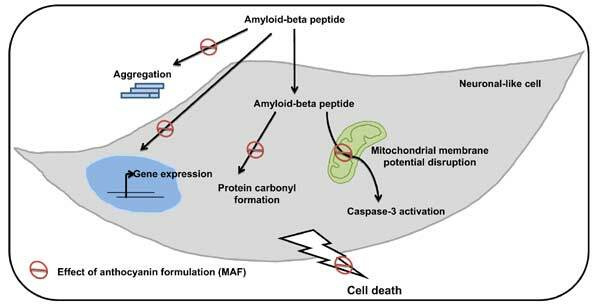 Keywords:Amyloid-beta, tau phosphorylation, apoptosis, mitochondrial membrane potential, oxidative stress, polyphenols, protein carbonyls. Abstract:Alzheimer’s disease (AD) is the most prevalent neurodegenerative disorder of aging. It is a multifactorial disease with several overlapping pathways. Therefore, successful therapy should target several pathological features simultaneously. In this regard, cumulative data have demonstrated that polyphenols can display neuroprotective effects through different mechanisms. In this study, we tested the hypothesis that a mixture of anthocyanins/anthocyanidins presents in the formulation MAF14001 may mitigate the amyloid-β peptide (Aβ) toxicity. Anthocyanins are a class of polyphenols capable to cross the blood brain barrier and their intake is associated to a reduced risk of some several chronic diseases. Our results showed that the formulation MAF14001 can protect SK-N-SH cells against Aβ-induced toxicity. From 5 µM, MAF14001 protected SK-N-SH cells against Aβ toxicity by preventing oxidative stress, mitochondrial dysfunction and apoptosis. Furthermore, MAF14001 might directly interact with Aβ to prevent its aggregation process, a key process on Aβ-induced oxidative stress. Indeed, in the presence of MAF14001, Aβ was less susceptible to fibrillation. Finally, MAF14001 decreased the tau phosphorylation (Ser-202) induced by Aβ. Altogether, these results demonstrated that MAF14001 could target multiple mechanisms involved in the etiology of AD and could be useful in preventing and treating AD.